Why is it Vulnerable and Endangered? 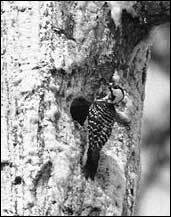 The Red-cockaded Woodpecker, or RCW, is one of eight species of woodpeckers that occur in East Texas. 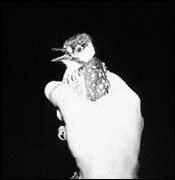 It is a small black-and-white bird about the size of a cardinal. Adult Red-cockaded Woodpecker at the nest cavity near sticky resin on the trunk of a live pine. The red patches, or “cockades,” on either side of the head on males is rarely seen as they usually conceal the red until excited or agitated. The observer usually needs binoculars to see the red. This woodpecker usually does not frequent urban settings and is not a familiar backyard species. It is not likely to be observed at a bird feeder unlike the Downy and Red-bellied woodpeckers, for example.